The Bridge Community Garden is located on the Albertbridge Road Belfast, positioned in front of the Business in the Community offices. The idea of a community garden stemmed from Business in the Community Northern Ireland. The land is owned by BT and was used as a car park for company vehicles. 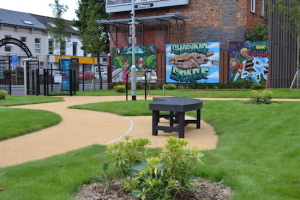 However BT kindly donated the land, and with funding from Biffa, The Department for Social Development and Belfast City Council, work started on the garden the garden in early 2014. With close proximity to Sure Start, an early years care organisation for children, the garden can be used as a secure play area. It is also hoped, along with the interest generated from the Soundscape Park Project, the gardens will be visited by the local community and beyond.